Stack-On Bookcase Is Part Of The Lorell Chateau Series That Offers Contemporary Laminate Office Furniture With A Durable Design And Multiple Configuration Options. Attach To A Chateau Lateral File For Extra Storage Without Expanding Your Footprint. Top Features Reeded Edge Detail For A Distinct Look. Design Also Includes A High-Quality, Mahogany Laminate Surface For Durability And Two Sturdy Shelves..
Stack-On Bookcase Is Part Of The Lorell Chateau Series That Offers Contemporary Laminate Office Furniture With A Durable Design And Multiple Configuration Options. Attach To A Chateau Lateral File For Extra Storage Without Expanding Your Footprint. Top Features Reeded Edge Detail For A Distinct Look. 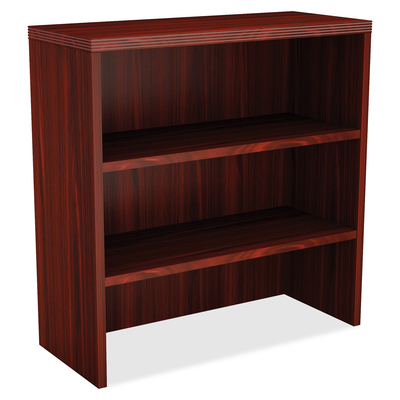 Design Also Includes A High-Quality, Mahogany Laminate Surface For Durability And Two Sturdy Shelves.